Info "Danger! Watch out for falling arrows!" No-Zone is Wario-Man's microgame in WarioWare: Twisted! The name is a pun on the "Ozone layer." Wario is standing on Earth and a swarm of arrows are going to rain down. The player must tilt the system to guide Wario in the area where the arrow's pointing. 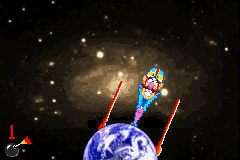 The player wins if Wario doesn't get hit by any arrows, and loses when Wario gets hit by an arrow. Level 1 – The arrows rain down after 2 seconds. Level 2 – The arrows rain down about 1/3 of a second earlier; some also land closer to the target. Level 3 – The arrows rain down at the same time as in Level 2, but some land very close to the target. This page was last edited on November 16, 2018, at 22:09.